The concept of making a survival keychain isn’t new. But one with higher quality parts that hits the mark between a day at the office and Armageddon is. Meet the Kaufmann Mercantile EDC Kit. 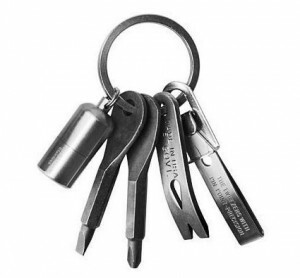 With a pry bar, tweezers, screwdriver keys, and a water proof lighter, the keychain EDC kit seems to cover the most basic of daily carry need–minus a cutting tool. At $44 the EDC Kit isn’t a steal, but the quality materials and attention to detail may make it worth the cost. Looks like they are reselling Countycomm stuff.